Come on in! 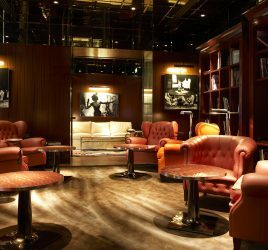 Let us show you round one of the finest cigar lounges in the world, perched on the top floor of the very exclusive Muse hotel in the Thai capital. Amid the joyous architectural chaos of Bangkok, The Muse is hard to spot first time around. A few short steps from Sukhumvit, the main shopping street, the most stylish hotel in the Thai capital has cultivated a sense of elegance. Subdued lighting, in a décor combining precious wood and volutes of wrought iron, where gold and black lacquer mingle with Asian design: F. Scott Fitzgerald’s jazz years meet the reign of Rama V, the traveler-king who ushered the kingdom of Siam into the modern era. 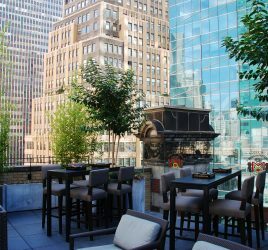 The hotel soon acquired its status as a top destination for gourmet tourists thanks to its Italian restaurant, Medici; as well as Babette’s, one of the city’s best steakhouses according to connoisseurs – although not the most expensive. Tea lovers – as well as those who prefer Martini – will feel at home in the Salon’s cozy environment. When night falls, however, it’s on the upper floors that it’s all going down. 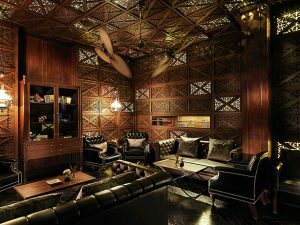 Elevated cigar lounges abound in Bangkok, but the Speakeasy, which sees itself as a clandestine bar under the prohibition, is unrivalled. Its strengths include the electro-jazz soundtrack, tapas from all over the world, and champagne and cocktails, of course. But its real added value is the incredible view of the city you enjoy from little private domes provided to patrons. The Blind Pig: did you say luxury? 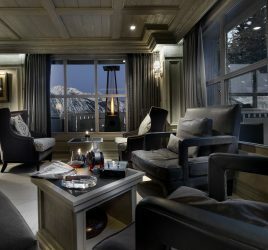 An oasis of peace in the commotion of the party: the Blind Pig, is a luxurious cigar lounge with its own terrace! The colonial-style decor is as elegant as it is spacious, and one instantly feels at home. Regulars even have the luxury of an embroidered silk jacket to protect their shirt from the smoke. Pretty sweet. Cigars don’t come cheap in Thailand so don’t forget to take a few sticks. At the Blind Pig, a Montecristo N° 4 will set you back around 570 Bht (approx. €15) and a Romeo y Julieta Churchills costs 1,250 Bht (just over €32). Beyond Cuba, the choice is limited to Dominican Cortès or chocolate, vanilla or cherry-flavored Mexican Chicos… The bar stocks the most famous brands of whisky, rum, cognac, and armagnac. For example, an Islay single malt like the Bowmore 15 years will cost you 620 Bht (€16) and a Havana Club 7 years costs half that. Hardly excessive considering the sumptuous surroundings.